Proud of you for getting your $H!+ together! 1. A double laundry hamper with removable laundry bags for separating your dirty clothes into two separate piles — perhaps regular wash and delicate wash, or lights and darks. Plus, its lid ensures clothes or yucky smells won't sneak out. This includes two removable laundry bags so you can easily transport those rather than the whole hamper, and also so that you can separate into two groups. It can hold up to four loads of dirty laundry! Get it from Amazon for $39.96+ (available in four colors). 2. A 10-pack of Wonder Hangers to help you group certain garments together, which in turn makes it easier to find that shirt you know you own, but can't seem to find no matter how many times you look. It comes with 10 hangers that can hold five garments each, 10 if you double them up! Get them from Amazon for $14.99 (originally $19.99). 3. An S-shaped hanger that'll provide the perfect solution to hanging up pants, jeans, and even accessories or linens! I personally find hanging jeans up side-by-side on separate hangers takes up quite a bit of space. Well... NOT ANYMORE! 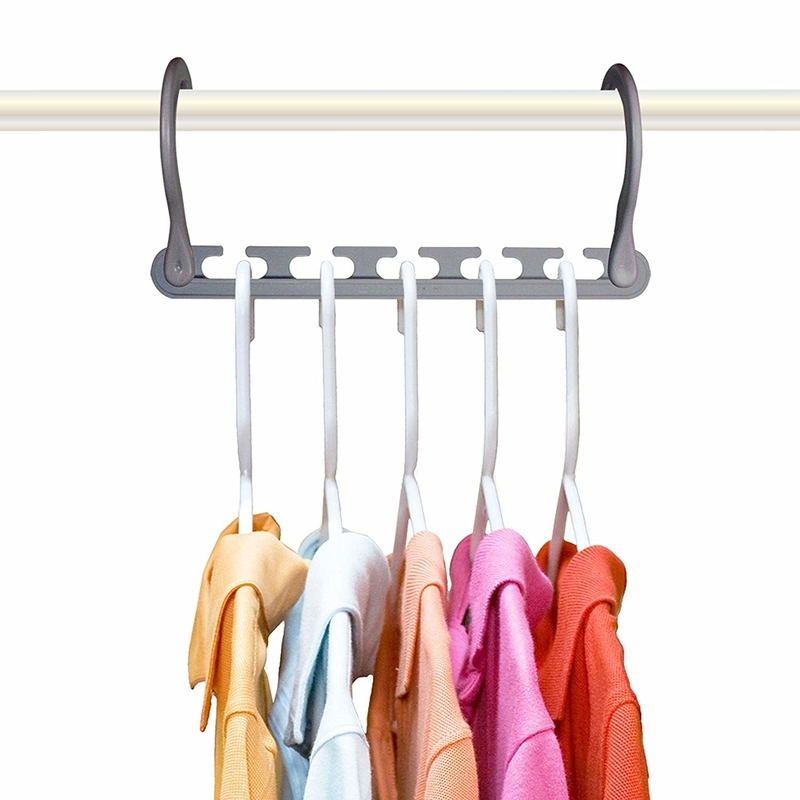 These durable, stainless-steel hangers can hold about five garments each! Promising review: "My closet was a disaster area. I couldn’t find my pants, shirts, really anything. I’m so glad I bought this. The three hangers hold 15 pairs of pants total — that’s a lot less hangers! I have more space now." —Amanda L.
Get it from Amazon for $9.87/1-piece, $17.55/3-piece, or $36.55/10-piece. 4. But alas, you may also want some *regular* hangers, so treat yourself to a pack of velvet hangers. If you've never used velvet hangers, you're in for a real treat. With most hangers, I find my shirts often slipping off and eventually wreaking havoc on the bottom of my closet, but these keep clothes in place! Get them from Amazon for $14.99/30-pack, $20/50-pack, or $37/100-pack (available in three colors). 5. A wall-mounted coat rack for hanging in your room or by the front door. Or order two and hang in both places, so belongings like your coat, hat, purse, umbrella, etc., are neatly hanging, and not strewn across your floor. Comes with mountain hardware and installation instructions to make setting it up super easy! Each hook can hold up to 5 pounds. Get it from Amazon for $19.99 (available in four finishes). 6. A three-tier shoe rack to prevent a clutter of shoes from building up, which let's be real, is an issue we all face. If you've somehow managed to prevent shoe clutter in your living space without something like this, then please help me out. This three-tiered rack can hold nine pairs of shoes total — three pairs per shelf, about 30 lbs. overall! This can be folded flat for easy storage. 7. Or a 24-pocket over-the-door shoe organizer that'll conveniently hang on a closet door, or even your bedroom door so you have a better place to keep your shoes than on the closet floor. Get it from Amazon for $7.97 (originally $9.99). 8. An eight-pack of shelf dividers for better utilizing shelf space in your closet, so not only will your floors not look like the inside of a hamper, but your shelves won't either! This easily clips onto existing wire shelves! 9. A four-pack of drawer dividers to prevent the overwhelming feeling we know you get when you open your drawer to find what looks like your undergarments trying to plan their uncivilized escape. This comes with four bins — the 6-cell bin is good for scarves and ties, the 8-cell bin is good for underwear, briefs, and ties, the 7-cell bin is good for bras, and the 24-cell bin is good for socks. Get them from Amazon for $15.87 (available in two colors). 10. A pack of washing machine cleaning tablets that'll make the actual chore of washing your clothes a lot less daunting knowing you won't have to deal with a funky-smelling appliance. Get a pack of six from Amazon for $12.97 (originally $13.98). 11. A cube organizer for stacking and creating your own arrangement of storage shelves. No matter how you set these bad boys up, they're gonna play an instrumental role when it comes to storing things like undergarments, T-shirts, pajamas, workout gear, and other knick-knacks in your room you never know where to store! You can opt to split your cubes up into smaller blocks or build into one big unit like the one above! Each cube holds up to 10 pounds. These are waterproof and dust-resistant. Recommended to clean with a cloth when dirty! Get them from Amazon for $69.99/16 cubes, or $79.99/20 cubes (available in two colors). 12. A pack of vacuum bags perfect to use when storing clothing items you're not planning on wearing in a given season and want less clutter in your closet! These don't create the same amount of bulk other storage bags would, so they're good to store under your bed! These bags are made with anti-microbial materials so you don't have to worry about things like mold, mildew, or bacteria building up. Plus, it comes with a free travel pump so these bags are truly perfect for packing on trips or when going off to college, etc! 13. A three-bag laundry sorter that'll provide more than enough space to separate your laundry into different piles based on how you need to wash them — and if there aren't a flight of stairs connecting you and your washing machine, then you can easily roll this babe from your room to wherever you do laundry. This has three removable bags for easily sorting and transporting laundry. 14. A bed you can easily lift for EVEN MORE storage! Only you and I have to know you bought this. Promise, I won't tell anyone your secrets. Get it from Amazon for $379.99+ (available in two colors, and two sizes). 15. A double closet rod to give you a whole second rod to hang clothes on — yeah, yeah, yeah, you're welcome. No need to thank us. Well actually, a small need to thank us. But yeah, you're welcome. 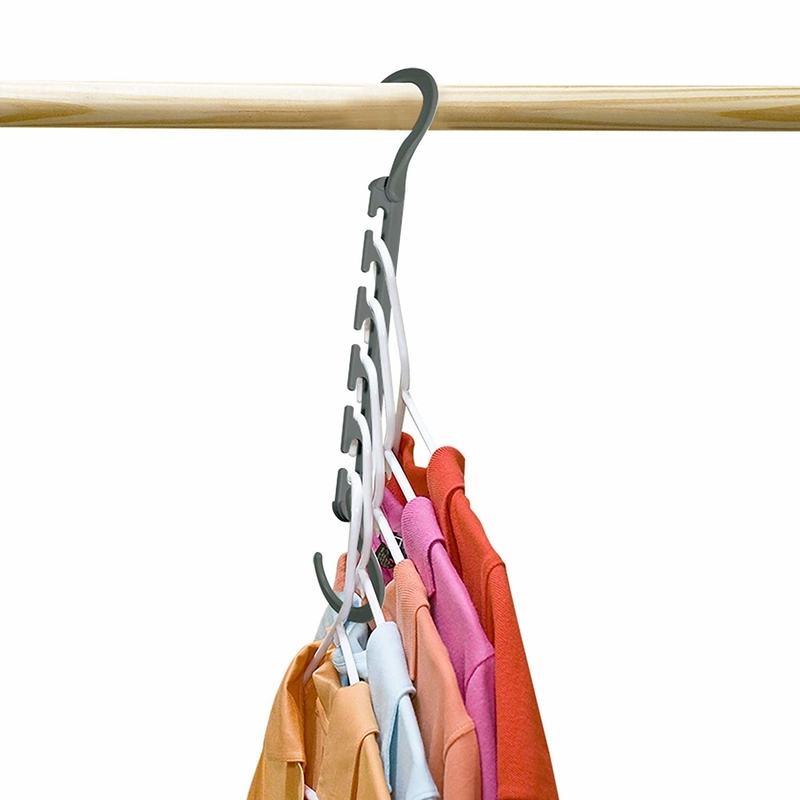 Hook easily hangs over your existing closet rod and is constructed from heavy-duty, stainless steel. Get it from Amazon for $11.14. 16. An eight-pack of bed risers that'll allow you to create more space to stow away storage bins filled with clothes and other belongings. Comes with four small risers, and four large risers — you can use just the small risers to elevate your bed 3 in., just the large risers to elevate your bed 5 in., or combine the two to elevate your bed 8 in. 17. A six-pack of clear, under bed storage boxes with lids for keeping things like clothes, shoes, and accessories you're not wearing at the moment, but are saving to wear in a few months from now. Get them from Amazon for $45.97. 18. A five-pack of boot shapers to help keep your boots at an upright position, because orderly boots is the first step to an orderly closet. These are good to use for any size or style of boots, and can be adjusted accordingly for ankle-high, calf-high, and knee-high boots. 19. A five-section hanging organizer that'll provide a bit more storage space in your closet. You can also use it as an especially cute way to plan an outfit for tomorrow, or perhaps five outfits for the week ahead! Made with metal hooks that easily hang from closet rods or garment racks. Promising review: "I love this hanging closet organizer, we are using it in our nursery and it is the perfect size for our small closet. I have purchased products like this in the past that had very little structure to them and they sagged at the top — this does not do that, it is very structured — it hangs exactly like in the picture. For a nursery, it is just what I was looking for. Highly recommend." —Chelsea C.
Get it from Amazon for $7.47. 20. A storage ottoman for doubling as a bench or foot rest, ya know, so you can reward yourself with relaxation for all the hard work you put into organizing your life. When you're not using this ottoman, it can actually be folded up and easily stored away! Get it from Amazon for $54.99 (available in six colors). 21. A jewelry tree to keep your jewelry in one easy-to-find everything place, while also giving your room a hella cute aesthetic. Get it from Amazon for $15.89+ (available in four colors). 22. A shoe rack bench that'll double as a cute little spot to sit when you get home at night, take a breather, take those shoes off, and neatly store them away underneath you. Prevent a big, ugly shoe mess just like that! This two-tiered rack can hold up to six pairs of shoes total — three pairs per shelf! Constructed with a sturdy, metal frame and a comfy cushioned seat with a faux leather cover! Get it from Amazon for $38.87 (available in two material tops).